The food bill isn’t so bad-about the same as a Shepherd or Lab. It’s the accessories that get expensive. Hats-Mastiffs drool. They shake their heads and the drool gets on the ceiling. ‘Nuff said. First Aid Equipment- Ointment for friction burns after you’ve been drug across the yard. Plaster cast for broken toes after a mastiff steps on them. Bandages. Mastiffs shed. It isn’t excessive, but they are so big that the hair adds up. Sooner or later, you won’t realize that one of the furballs you vacummed up was actually the cat. The bandages are for after you let the cat out of the bag. She won’t be happy with you. Yard Cleanup-you need a snow shovel and a wheelbarrow. Hip waders are recommended. Gas masks are optional, but you’ll probably want one, in case you can’t get out of the room fast enough when a mastiff breaks wind. And have I mentioned the snoring? The house shakes and may slide from its foundation. You’ll stuff your ears with cotton because you can’t hear the TV anyway. 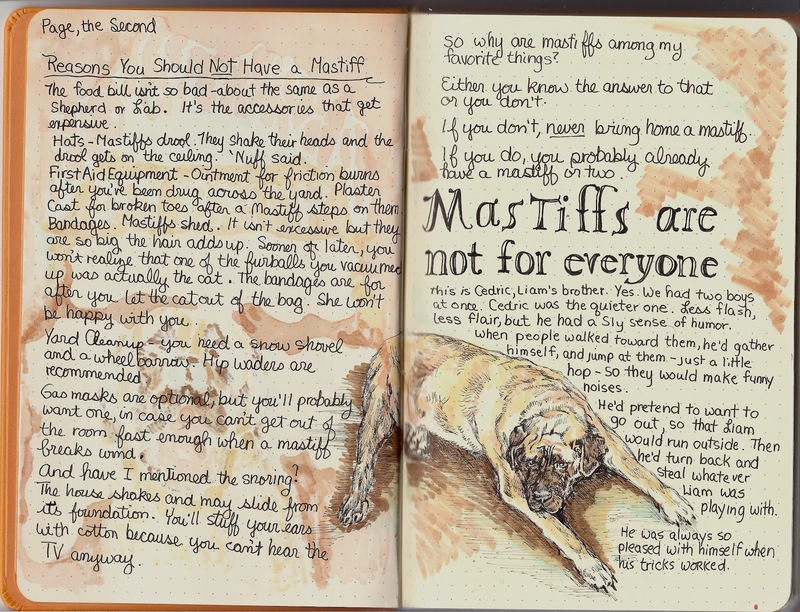 So why are mastiffs among my favorite things? Either you know the answer to that or you don’t. If you don’t, never bring home a mastiff. If you do, you probably already have a mastiff or two. This is Cedric, Liam’s brother. Yes. We had two boys at once. Cedric was the quieter one. Less flash, less flair, but he had a sly sense of humor. When people walked toward him, he’d gather himself, and jump at them–just a little hop–so they would make funny noises. He’d pretend to want to out, so that Liam would run outside. Then he’d turn back and steal whatever Liam was playing with. He was always so pleased with himself when his tricks worked. We recently adopted two mastiffs of senior citizen status.I have had Akitas in the past, but Lucy and Linus are the first mastiffs we've owned.The drool/slobber/slimetrail phenomena has reached Olympic Sport status in our household. Either that or go insane cleaning high test slime trails from the rafters. Wer adore Lucy and Linus. I'd never want another kind of dog again. They are wonderful. I'm laughing out loud- by myself so the folks walking by the gallery are giving me strange looks. Beautiful page plus clever, hilarious content. Great job! Fantastic! I'll bear all this in mind if I'm ever thinking of getting a dog… And if not, thanks for making me laugh! Oh my, I still want a dog but can't have one due to husband's asthma and dog ban in our house. Your writing is as beautiful as your artwork! Thanks for posting here! Ooooh, I'm really enjoying this sketchbook! Your sketch of Cedric is smashing! And the text is fantastic. Keep 'em coming! I think mastiffs may be the most wonderful breed of dog in the world. I know many wouldn't agree–but they've probably never owned one. Thank you for letting me know I made you laugh. It makes my day! Thank you. I can't have a cat because my husband is allergic to them, and I like cats almost as much as I like dogs. I hope you manage to get a dog one of these days–maybe one of the breeds less likely to set off an asthma attack. I keep trying to talk my husband into one of the cat breeds like that. We still haven't got another dog. I think we would still compare it to the boys and that wouldn't be fair. One of these days though. Thank you! I'm having a great time reliving my days with them–though it does make me a bit sad. It's the good kind of sad,though. Aww…what sweet memories. Mastiffs seem so cool:) I'd love to have a dog but my apartment is too small. Thanks for sharing your talents with us.